The Portuguese were in Macau for around 450 years and only gave the territory back to China in 1999 (two years after Hong Kong was returned). The most famous landmark is the façade of St. Pauls, a Jesuit church that burned down on three separate occasions in its history (a hint from above perhaps?). This famous ruin is the main spot for visitors taking group photos and selfies. Personally I don’t see what all the fuss is about but I suppose it has to be ticked off the list. Leading up to the St. Pauls steps is the pedestrian shopping street Rua de São Paulo which begins in Senado Square. Together they form the epicentre of the old town. There are a few attractive historical buildings along here, like these two wedding cake churches. You know when you’re in the old town because all the pavements are mosaics. Above St. Pauls, at the top of Mount Hill, is the Mount Fortress which was built by the Jesuits between 1617 and 1626. The guns have a commanding view over the bay and the town as you can see from my short video. It was demilitarised in the 1970s and is now the location for the Macau Museum www.macaumuseum.gov.mo/ which I didn’t have time to see sadly. It was a bit cloudy on the day I went but the views were still good. The forsest of cranes on the horizon point to Macau’s status as one the fastest growing metropolitan areas in the world. On the other side of Mount Hill, the streets around Igreja de São Lazoro (the Church of St.Lazarus) are nice to walk around. I walked along Calçada da Igreja de São Lázaro which has some attractive old buildings. At 7 Calçada da Igreja de São Lazoro is Chui Lok Chi Mansion. Once a Catholic school it now houses the Tai Fung Tong Art House, a cultural centre. It was constructed around 1860 by the Zheng family. With more than sixty rooms and a series of courtyards it is Macau’s largest mansion. Not all the rooms are open though so you only need about thirty minutes here. It has many of the characteristics of a traditional Guangdong residence, including moon gates; circular doors between garden areas. It subtly incorporates architectural details from other cultures as well, such as arched doorways and French windows. One of my favourite features is that the drainpipes are designed to look like bamboo poles. Elsewhere, at 975 Avenida da Praia Grande, is the Clube Militar de Macau, now a private club clubemilitardemacau.net. The restaurant is open to the public but I mistimed my arrival so I didn’t get to eat here. Inside it looks like a very atmospheric dining spot. My time in Macau was limited so I didn’t get to see everything I’d like to. Here are some suggestions for walking tours which I didn’t have time to do; two from Frommers here and here and some ideas from the local tourist board here. My Google map with all these places on is here. Please see my previous posts for food and modern architecture in Macau. This is a suggested itinerary for trying a few local delicacies. I’ve organised the walk partly according to geographical location and also in the order you might want to eat the foods in. I’ve put everywhere mentioned on this Google map. In the 60s and 70s, after anti-Chinese riots in Rangoon, some Burmese of Chinese descent came to settle in Macau. This shop was opened in 1978 and specialises in Burmese cuisine. They serve a mean Burmese samosa (B+). I’d come to try their most famous dish, Massinha de Peixe (fish with noodles), which consists of a rich fish stock with the addition of lemon, black peppercorn, coriander, turmeric, chilli and banana tree stem, eaten with vermicelli rice noodles and garnished with lime and split chickpea fritters. I’m an afficionado of noodle soups but this little combo was completely new to me and I really liked it (B+). This ice cream parlour is one of my top picks for two reasons. …and secondly I love the nostalgic feeling of eating their old-school handmade ice cream. Just a couple of blocks away from Lai Kei ice cream parlour is this great little hipster coffee shop which serves a tidy cuppa (A). Back in the old town, one thing you’ll see a lot of along Rua de São Paulo, is the famous Macanese jerky. It’s a variety of Bakkwa, a centuries old preparation of dried meat from China. For many Chinese tourists from the mainland it’s a popular souvenir to take home. Pork and beef varieties are popular here and come in multiple flavours including black pepper, chilli, five spice, abalone and honey-roasted. Don’t worry if you don’t know which one to get, the street vendors will cut off strips for you to try. I particularly liked the honey-roasted flavours but I do have a big sweet tooth. Despite a name that invokes images of a difficult-to-chew dried meat, I found it to be quite moist and very edible. In the Macau episode of his No Reservations series, Anthony Bourdain was brought to this steamed milk custard vendor. It’s one of the local delicacies, served for over 150 years in this shop, although he didn’t really come across as a fan (from 36.16 in the video). There a few kinds to choose from, the most common being the white milk custard and the yellow egg custard varieties, served either hot or cold. However many people prefer the ginger or red bean versions as they have more flavour. I had the classic cold white milk pudding which was fine but completely bland (B). There are of course heaps of other places to eat including plenty of street vendors. This very popular stall selling Cantonese style street food was on Travessa do Mastro, just around the corner from the Fat Siu Lau restaurant. Here’s a link to some other examples of Macanese cuisine. I only had two nights and three days here but I did my best to eat around as much as possible in that time. The next post describes a food walk where you can try several different kinds of food and drink but here I’m focussing on restaurants influenced by the Portuguese empire. All the restaurants mentioned are on this Google map. This rustic Portuguese restaurant (a local institution since 1986) came recommended by Anthony Bourdain and also my good friend Tommy K who knows his grub. Hac Sa beach is a bit of a trek from town but it’s worth it for the good food and fun atmosphere. This was defintiely my best restaurant experience in Macau. The house speciality is the Leitao Assado no Forno, or suckling pig, which is delicious (B+). It came with chips and a green salad (both B), but I added on a tomato salad as well. Unexpectedly the tomatoes were fantastic (A). …which was decanted at the table. I finished with a hefty slice of flan (B) and something strong and sweet from a tiny barrel. My memory doesn’t recall what it was, only that it was good! (B+). Taxis seemed to be a problem for some reason (maybe prebook a cab for your return) but a friend of the restaurant drove me home for a fee and kindly stopped off for me to see some of the casino sights on the way back (see previous post). A local colleague brought me here for lunch. They’ve been serving good homemade Portuguese food since 1918. Nothing special, just plain, good honest food. I enjoyed their croquettes (B+). Portuguese Pastéis or Bolo de Bacalhau tend to be made with mashed potato without the addition of Béchamel sauce, unlike Spanish croquetas. A main of plain grilled sardines (B+) and a bit of salad saw me right. This old restaurant has been a local institution since 1903, currently recommended by Fodor’s. I came here on my first night hungry for a change from Chinese food. The house speciality is ‘Pombo Asado’ aka ‘Shek Ki Superb Roasted Pigeon’, but I was hankering after seafood so I started with a plate of clams, hoping they’d be plain but found them just acceptable in a sauce (B). I followed up with the grilled prawns in a garlic and butter sauce, or Camarãos Grelhados Servidos con Molho de Alho e Manteiga which were okay but not particularly inspiring (B). I washed these down with a couple of cans of Portuguese Sagres beer (B). For dessert I was intrigued to see Norwegian Almond Krumkake Rolls on the menu (those sailors do get around). Krumkaker are waffles that are bent into cones whilst still hot, similar to Sicilian cannoli, and served with whipped cream as they are here or perhaps used as ice-cream cones. Being in possession of both part Norwegian and sweet-toothed these were hard to refuse, luckily as they were the best thing I had in the restaurant (B+). Portuguese custard tarts are one of my favourite things in life and this is one of the best places in Macau to eat them. According to popular wisdom, Lord Stow’s bakery is the best to have them but I didn’t have time to go over the other side of the island to his place). Fortunately this rival establishment, opened by his ex-wife, does a mean pasteis de nata as well (B+). Macau is the gambling mecca of China, a nation that loves to bet. Unlike the mainland, gambling is legal here, with the result that it has developed into a huge tourist industry that dominates the Macanese economy. It’s been calculated that the gambling sector in Macau in 2014 was five times larger than that of Las Vegas! Again unlike the mainland, prostitution has also been decriminalised and drugs are said to be readily available. Unsurprisingly these rackets have attracted the interest of the Triads and other criminal gangs. This combination of ingredients have made Macau the primary place on the planet for spending money on pleasure. It’s a den of iniquity if ever there ever was one but it’s a fascinating place to observe from the outside. All of the places mentioned in these posts are on my Google map, here. The oldest casino is The Grand Lisboa which was built in the 60s (brief video here). The casino’s gaudy hotel (built in the 70s) dominates the skyline and you can see it wherever you go in the centre of town. The building is supremely ugly but the lights are quite fun to watch at night. Video here. The huge foyer is a supreme example of bad taste. As it’s a casino, they don’t like you taking photos inside. I was told to stop after taking this one. The Grand Lisboa is out of date now as huge sums have been ploughed into building new casinos in a dedicated zone of reclaimed land outside the main urban area known as the Cotai Strip . Probably the most famous casino is The Venetian which is the world’s biggest with a gaming floor that covers 546,000 square feet. Just over the road is The Parisian which even has a replica of the Eiffel Tower standing outside it. On the way back from eating at Fernando’s (see later post) my driver stopped so I could watch the world-famous fountain show at the Wynn Palace which was truly a bizarre experience. The spectacular roaring fountains erupt with the force and noise of a firework display. All the while cable cars pass over and through the fountains to the sound of music. When I was there a very loud recording of the Artful Dodger singing ‘Consider Yourself At Home’ was blasting out over the speakers. Seeing and hearing is believing; watch my video here. Back in town, there are plenty of new buildings but none of them are particularly attractive. Most people seem to live in apartment blocks of varying sizes, I didn’t see any individual houses. My driver told me that real estate in Macau has increased so much in value that ordinary local people can no longer afford to buy their own property which is a sad state of affairs. On to the food next! The skyscrapers of Central are one of the must sees of any trip to HK, not that you can really miss them. The night time view is particularly impressive. The Kowloon scrapers are quite imposing too, but they are less tightly packed. I’ve given them their own post called ‘Food with a View’. In the post I recommend Eye Bar as a great spot to view the Central buildings at night. One thing you may hear about is the Symphony of Lights, a daily light show at 8pm each evening where the scrapers on both sides flash their lights in time to music. The best places to watch the show are from the promenade outside Golden Bauhinia Square in Wan Chai or the Avenue of Stars on the Tsim Sha Tsui waterfront, or you could do what I did and catch a special sightseeing ferry across Victoria Harbour from the Star Ferry pier in Tsim Sha Tsui. 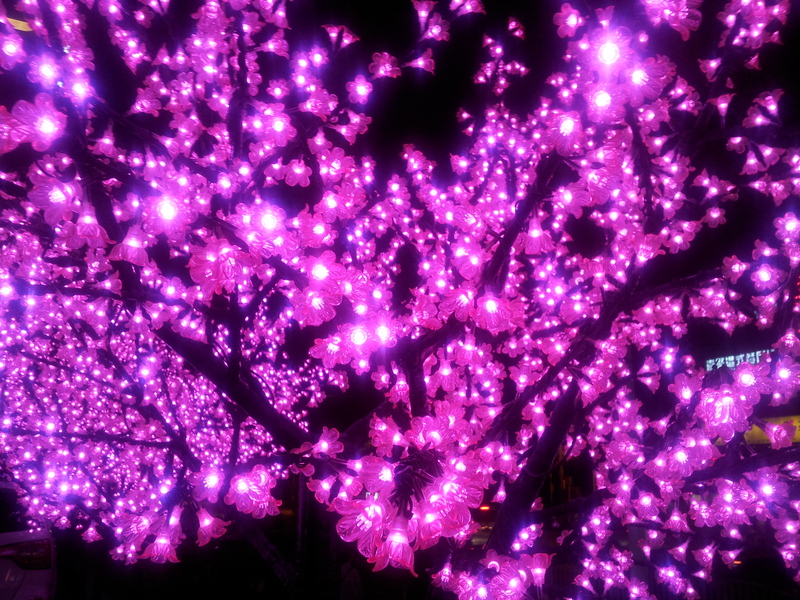 The Symphony of Lights Harbour Cruise cost HK$205 in 2017. More info here. Sadly though I have to say I was less than impressed by the experience. The music was tinny and failed to move me in any way, and the lights on each skyscraper seemed to be doing their own thing rather than linking up. You do get a good view of the buildings though. Video here. My favourite skyscraper as I mentioned before is the ICT (more pics in the ‘Food with a View’ post). How well you can see everything depends on how lucky you are with the weather. You can count on a few pea-soupers every now and then, although this can sometimes add to the atmosphere. These pics are of The Center, which is the fifth highest building in HK. Not sure where in Central I took this random shot. Elsewhere, the flashing lights on this skyscraper in Causeway Bay were quite fun. Video here. These residential buildings are in Sheung Wan, near Man Mo temple. I stumbled across a couple of older buildings in Central that I liked. Please also see my previous post on Innovation Tower which is a very special building indeed. To be honest, despite being a futuristic city (the inspiration for my favourite film Blade Runner among others), I think most of the modern architecture in Hong Kong is pretty dire. There is the odd exception, such as the Jockey Club Innovation Tower designed by Zaha Hadid. I’m a big fan of the late architect so on my day off I got the MTR over to the University of Hong Kong campus in Hung Hom to visit the School of Design. It totally deserves it’s own post. You’ll find it on the Google map. I managed to wander around the building taking snaps without any hassle. I’m not sure what security is like usually but maybe the fact it was graduation day helped make me relatively inconspicuous. Click on the photos to see them at their best in full-screen slideshow mode. Imagine being a design student and getting to study in this amazing building. I’d be very inspired by it. Please see my other posts on Architecture, Markets , Bars and Restaurants (Chinese, Asian, Noodles, Dim Sum) for more places to check out on Hong Kong Island. Here’s some more stuff to do that doesn’t fit into any of the other posts. Everywhere mentioned is on this Google map. Each time I’ve been to HK one of the highlights has been a visit to Happy Valley racecourse. The course is set against a magnificent backdrop of tall buildings which must themselves have a fantastic view of the races and the impressive grandstand. I like to go down to the paddock to choose my horses. Video here. In 2006 I picked several winners and went home buzzing with a few hundred dollars. No such luck in 2016 when every nag I bet on lost by several lengths. Not a single horse came in for me and I soon lost all my allotted budget of a few hundred dollars (I’m no big timer). Video here. But you can always console yourself with snacks and beer. Another fun thing to do is take a ride on the trams. Video here. It’s only $2.30 (exact change only) and they also accept Octopus cards. You get on at the back and then pay at the front when you’re getting off. There are special 1930s open top sightseeing trams and you can even hire a party tram! A walk down Hollywood Road provides a few sights. Frommer’s self-guided walking tours are quite informative if you want to know more about the places you are passing. It might not look it but this guy is actually going backwards. Push carts are definitely still a thing here. Towards the end at 124-126 Hollywood Road is Man Mo Temple (open daily from 8am to 6pm) which pays tribute to ‘Man’, the God of Literature and ‘Mo’ the God of War. Built in the 1840s it’s Hong Kong’s oldest temple. Click on the pics for a full screen slideshow. This fun automaton was outside when I was there. There’s a smaller shrine on the stairs at the top of Peel Street. The huge incense coils are purchased by people who want their wishes to be granted. They can take as long as three weeks to burn. Of course The Peak is a must do. I went up in 2006 but have lost the photos sorry. I recommend taking the funicular up and then doing the Peak Circular Walk on the way down. Next time I go I’d like to walk the Dragon’s Back in Shek O country park. 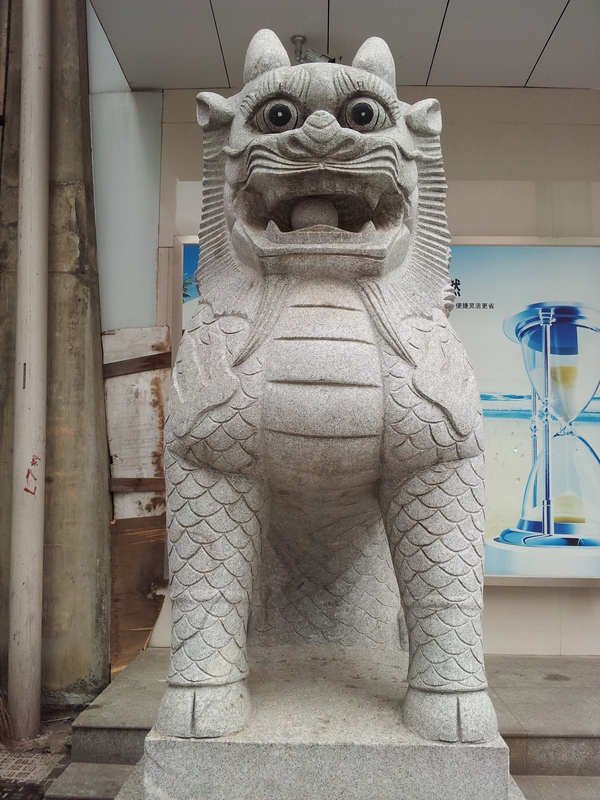 The first half of this post is mainly for my colleagues staying in Mongkok, the second half is for all the bits and pieces I have left over about south Kowloon. Our employer puts us up at the Royal Plaza Hotel at 193 Prince Edward Road West, Mongkok, www.royalplaza.com.hk. It’s an excellent hotel with great facilities including a big, well-equipped gym and a large outdoor swimming pool. The breakfast is fully comprehensive with plenty of choices and the restaurant has a good rep although I’ve never tried it. You even get a free mobile phone to use during your stay. The views of uptown Kowloon from my hotel window were great. In terms of logistics, the hotel so well located that you can be in Central within forty minutes (on foot followed by metro) or instead head out to the New Territories without having to travel through town. And it’s within walking distance of all the temptations of Mongkok. Please click the Mongkok link on the home page index to access reviews of all the eateries I’ve been to. Everywhere mentioned is on this Google map. When heading south on the MTR to Central, the two nearest stations, Prince Edward and Mongkok, are equidistant from the hotel, but I prefer to go to Prince Edward as the station is much less hectic. The Prince Edward station is also near the Sunshine Laundry at 44-62 Tai Nan Street, www.sunshinelaundry.com.hk (exit C2 of Prince Edward MTR) so you can pick up your dry cleaning after work (opening hours are 0800~2100). Dry cleaning one shirt cost me HK$17 as opposed to HK$90 to wash and another HK$68 to iron in the hotel! It can take 5 days for it to be ready though so some forward planning is required. On the other hand, at the weekend, if you exit Mongkok station via exit B2 on Fife St, you get to witness all the madness on Sai Yeung Choi Street. Street performers take over between noon and 10pm on Saturday and Sunday when the area is made pedestrian only. Buskers, boppers, singers and various talent show hopefuls come together to create mind-boggling mayhem. It’s definitely a spectacle worth seeing. For a taste of old Hong Kong, I recommend a walk along Reclamation Street. It’s not a particularly pretty area but it’ll give you a good idea of how things used to be. The area is ripe for redevelopment and probably won’t be around much longer. On the subject of construction, it’s interesting to observe that builders in Hong Kong always use bamboo scaffolding, even when constructing modern skyscrapers! Bamboo is much more flexible than metal scaffolding but I still wouldn’t like to be bouncing around on it at the top! Next to the entrance of the Holiday Express on Dundas Street there’s an imitation of a Banksy stencil. In the original the rioter is throwing a bunch of flowers but this has been replaced by a book in the Hong Kong version. The piece is a controversial comment on the authorities draconian response to the democracy demonstrators earlier in 2016. Nearby Portland Street is also very atmospheric to walk around at night. 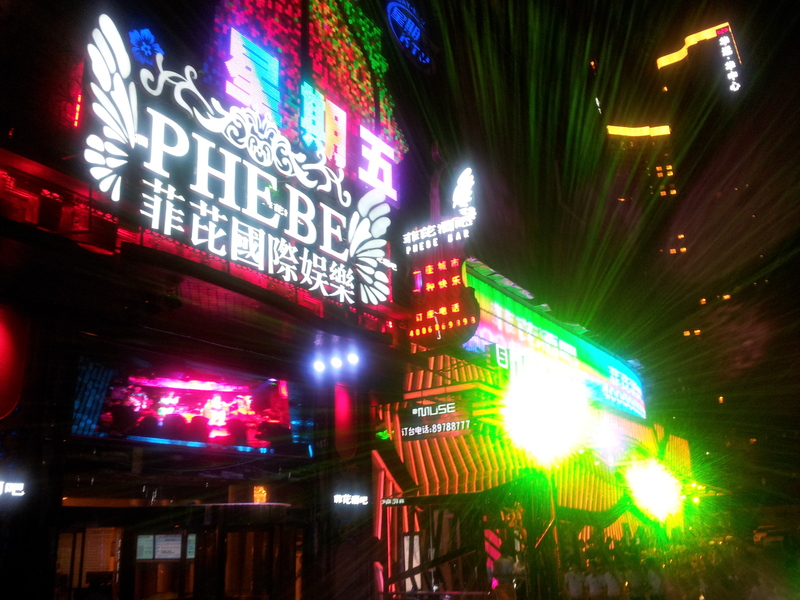 It’s Hong Kong’s red light district so it has a very seedy atmosphere but it’s relatively safe. There’s a Snake Restaurant here but I never had the courage to go in by myself without knowing what to ask for. I did a fair bit of shopping on my 2016 trip. I bought a new Samsung Galaxy S8 from a vendor at Sin Tat Plaza at 83 Argyle Street (Mongkok MTR exit D2). This shopping centre for phones was once notorious for rip-offs and fake models but has been (mostly) cleaned up in recent years. My phone was £150 cheaper than at home but I later found out the charger socket was faulty, hence the price. It wasn’t a problem (I got a wireless charger) but if you want more security then go to Broadway or Fortress (branches all over). Buying products that have their own box is a way of making sure they are original. Reviews here. Other than China, I don’t think I’ve been anywhere where people are so addicted to their phones. Hong Kongers seem to be constantly on their mobiles when they’re walking around. I also got a suit made at Sam’s Tailor at Ground Floor, K&L Burlington Arcade 90-94C Nathan Rd, (Tsim Sha Tsui MTR Exit B1) www.samstailor.com. He’s the most famous tailor in town and Kylie Minogue, Gwen Stefani, Avril Levigne, Bjork, Roberta Flack, Celine Dion, Steffi Graf, Joan Collins, Naomi Campbell, Hilary Clinton, Condoleezza Rice and Madeleine Albright, amongst others, have all been customers. You will run a gauntlet of other tailor touts on the way so you could compare prices but I didn’t bother. I’ve barely worn it but the suit fitted well despite being pretty cheap (around £200 as I recall). I also got two pairs of reading glasses around the corner at Tai Kwong Optical, 22-28 Mody Road, taikwongoptical.com. The quality was good, prices were fair, and he had a good selection of frames. Small shops like this will give you a better price than the chains. While you’re in the area you could drop in on the Avenue of Comic Stars over the road at Kowloon Park Drive, www.comicavenue.hk. Handy if you have kids to entertain but a bit silly otherwise. Here are a few signs I came across that tickled me. Walking around Hong Kong Island next! As regular readers will know, I love markets, especially food markets, and Hong Kong has heaps of them. Here are a few I’ve been to. Fa Yuen Street Market sells clothes, bags and electrical items as well as fruit and veg and other foodstuffs. The stalls are open from 10am to midnight at the northern end of the street. This lady is deseeding a Jackfruit or Bōluómì (菠萝蜜). Fa Yuen is also known as ‘sneaker street’ as there are lots of shops along the southern section selling sports shoes. They’re a bit cheaper than at home but good luck telling the snide from the real. Located at 123A Fa Yuen Street, this is a very typical Chinese food market. As such some of the sights captured in these photos are not for the faint-hearted. You have been warned! Freshness is very important for the Chinese shopper and this market is one of the few places you can still select a chicken while it’s still alive and have it butchered in front of you. The same goes for fish which are kept in tanks ready for purchase. You can click on these pictures to go to full-screen slideshow mode. …the bright orange things are pigs’ fallopian tubes, or Shēng Cháng (生肠), a common street food delicacy that I’m still plucking up the courage to try. The cucumber shaped with the ridges is Sin Qua (絲瓜 or 勝瓜), or in English, amongst many other names; Angled or Ridged Luffa, Silk Gourd, Chinese Okra, or formally Luffa Acutangula. Originally from India, it tastes similar to okra and courgette. The plant with the green leaves and white stems is called Pak Choi or Bok Choy (上海青). I tend to call it Pak Choi as the translation ‘Chinese Cabbage’ is highly ambiguous. Cantonese wind-dried sausages are called Laap Cheung (臘腸). They’re a slightly-sweet mix of pork fat and meat and sometimes include offal like liver. Other ingredients are light soy sauce, salt, sugar and rose wine (Mei Kwei Lu). Spices such as Chinese Five Spice, Sichuan Pepper Powder and chilli powder might also be added to create different flavours. The northern end of Tung Choi Street (between Mongkok Road and Prince Edward Road West) is lined with pet shops. Goldfish and other exotic aquatic species are available to buy here. One shop proprietor wasn’t keen on me taking photos of the turtles and puppies so I laid off but I got a few of the fish. If you like your blooms you should take a stroll along Flower Market Street which has over fifty flower vendors. The legendary night market, running from 4am to midnight. It’s definitely worth a wander but it’s full of rip-off merchants so be careful what you buy. I bought several novelty cigarette lighters back in 2006, but they stopped working pretty much straight away. The street food is probably fantastic but I can’t take the risk of eating it due to my job. Bonne chance! A dingy but atmospheric old market that’s good for photo ops. It starts at 4am so it was pretty quiet when I arrived around lunchtime after working nearby. Apparently it’s disputed territory between Triad clans and gang fights have occurred, although tourists don’t have anything to worry about. The most action I saw was an animated game of Mah Jong. There are lots of strange fruits and veggies on display. Click to go big. The long green beans, Dau Gok (豇豆), have many names in English, including Long-Podded Cowpea, Yardlong, Snake, Pea, Asparagus or Chinese Long Bean. The photo shows both types; the light green ones are known as ‘baak dau gok’ or literally ‘white long beans’, and the dark green are known as ‘cheng dau gok’ or ‘green long beans’. The warty green vegetable is I think is a fatter than usual variety of Bitter Melon aka Bitter Gourd, or Kǔguā (苦瓜) in Chinese. No idea what the long brown things are. The pink and yellow gnarly fruits are two kinds of Dragon Fruit or ‘Huǒlóngguǒ’ (火龍果), whereas the squarish orange ones are upside down Persimmon or ‘Shizi’ (柿子). The red fruits are called ‘Lián wù’ (蓮霧) in Chinese and in English they’re known as ‘Roseapples’ or ‘Lillypillies’, or more formally as Syzygium Cumini. and can be eaten fresh or used for jams and jellies. Cloves are the dried flower buds of it’s relative Syzygium Aromaticum. On sunny Autumn days, everywhere you go you’ll see green mandarins being peeled and their skins being dried. ‘Chenpi‘, prized for it’s bitter flavour, is used as a cooking ingredient as well as a medicine. It’s easy to make but you have to wait at least three years for the flavour to develop. Pottinger Street also known as Stone Slabs Street due to its granite steps on the section between Hollywood Road and Stanley Street. …as well as Father Christmas outfits, feather boas, multi-coloured wigs and all other kinds of party supplies. Further up the hill, the Graham Street fruit and veg market has been operating for 160 years making it Hong Kong’s oldest street market. Sadly the area is under threat due to redevelopment so go while you can. You can click on these pics to enlarge them. The segmented brown vegetable at top left is Lian Ou (莲藕) or Lotus Root. There are a few things I’ve been unable to name. Can you help me out? Here are a few bars I liked in 2017.They’re all on this Google map. Top notch mixology with prices to match. This sleek bar could double as a science lab with such exotic kit as a centrifuge, a rotary evaporator, a sous vide and vacuum machine all being used to assemble the exotic creations on the menu. This is the home of Hong Kong’s most famous cocktail, the Earl Grey Martini. Earl Grey tea infused ‘pearls’ of sodium alginate (a seaweed extract used as a food stabliser) float in a pool of cucumber, elderflower, Ketel One citrus vodka, Cointreau, lemon and lime, topped with a foam crown made using an aquarium air pump. It’s massively poncey and a bit difficult to drink, but I liked it (B+). The bill came to a hefty HK$143. Recommendations from others include the Touch of Rose and the Oolong Tea Collins. A smaller, less pretentious bar around the corner from Quinary but also selling original and inventive cocktails. I had a decent Dark ‘n’ Stormy (spiced rum, ginger beer, bitters) and a nice chat with the barman. As it was happy hour the bill only came to around HK$100. Also around the corner from the above, their outdoor terrace is a nice spot for a drink. The setting is the outdoor gardens of the PMQ, formerly a housing complex for married policemen and their families, now a centre for creative industries. It’s also a Michelin star restaurant (untried). This speakeasy type place was recommended by a friend but, although I tried a couple of times, I couldn’t get in as you have to be outside at a certain time to be inspected for admission. Their entrance policy is quite controversial, see the negative reviews on TA, but I wanted to try it for myself. Next time. High end food and drink with a Japanese slant. Cosy neighbourhood bar selling American-Korean fusion food. Of course the craft beer revolution has reached Hong Kong as well. I came with my friend Kelvin, a beer aficionado who gave it a good rating. I had a glass of IPA which was fine but more expensive (about HK$45 a half pint) than what I’m used to paying back at home in Sheffield (the beer capital of the UK) but then this is Hong Kong. We liked it though as it has a good atmosphere. You can even stand outside and simultaneously drink and smoke if that is your want, which is impossible to do in the UK now. Roof top bar with a fantastic view. Review here. On this trip I deliberately avoided the three main drinking areas for Westerners, although I have passed through them on occasion so I know what they’re like. If you want frenetic townie action it can be found at Knutsford Terrace in Kowloon and Lan Kwai Fong and Wan Chai on Hong Kong Island. Here are my thoughts on the Japanese, Korean and Thai restaurants I’ve been to in Hong Kong. They’re all on this Google map. This hipster Japanese-style yakitori and cocktail joint was the talk of the town when I was in HK in 2017. It took me two attempts to get in as they are very popular and it’s not possible to reserve so I went early one evening and got told to come back in half an hour. After a drink up the road and another short wait, I finally managed to get a seat at the bar. As usual I began with some Edamame (steamed fresh soya beans) while I read the menu (A). The friendly bartenders plied me with Sake (rice wine), Shōchū (stronger rice wine) and Umeshu (shōchū steeped sour plum and sugar rice wine), the last of which I’d never fully appreciated until I came here, despite having lived in Japan for a few years. The grading kind of went out of the window as I got to taste a fair few varieties, all good (A/B). The best was the house shōchū which I just couldn’t get enough of. They’d been experimenting with steeping the plums for longer and longer periods and the results were excellent (A+). Yakitori are chicken parts on skewers that are grilled on a small barbeque. I had the Liver with sansho and tare dipping sauce (B) and the Meatball with tare and egg yolk (A). I enjoyed the Cucumber Salad with sesame, miso and pine nuts B+). And I loved the Scotch Egg with cabbage, tonkatsu sauce and Kewpie mayonnaise (A). The Rice Cakes with furikake seasoning and sesame were good too (A). Everything was excellent and I loved it, but it’s really expensive! I waxed over HK$1,000 in here so not somewhere you could go every day of the week, unlike this next place I went to in 2006 which also does great Japanese food. This is a very authentic Izakaya, the nearest equivalent to a pub in Japan, except that it serves a very wide variety of foods. This was just like going back to Japan for me; all the food was excellent and absolutely the real thing. My friend Ethel and I started with edamame followed by sukiyaki (beef simmered in sweet sauce and dipped in raw egg), grilled fish, miso soup, sushi and sashimi and finishing with sake onigiri (salmon in balls of warm rice). Absolute heaven. This is the sister business of trendy Yardbird above. It’s a speakeasy type of affair with an unmarked door and no sign, so it took me a couple of attempts to find it. It’s not as busy as Yardbird, which is a good thing as it’s smaller with seats at a single long bar. The food is very good apparently, they do a tasting menu, but I’d already eaten and was only here to feed my newly attained shōchū addiction. They have the same house shōchū as in Yardbird, but it’s even more expensive here. I had three Chikusen Junmai; a handmade umeshu using junmaishu (premium sake with no added alcohol), which cost me HK$630. I loved every droplet (A+) but it was hard to justify spending that amount. A great place, but sadly one for people who get paid a lot more than I do. I’ve also been to a couple of Ramen shops, Yokozuna Japanese Noodle Shop and Ippei-an Ramen, reviews for which you’ll find in my post on famous noodle shops in HK. I’m a massive fan of Korean food and I can’t get it in my home town, so I filled my boots while I was here. Hong Kong has a big Korean community and their restaurants and other businesses are centered around Kimberley Street, and the streets around it, in Tsim Sha Tsui. The area is called Korea Town but that makes it sound more exciting than it is. By day scrap dealing seems to be the main activity on Kimberley Street. I came to this place on the off chance, after wandering around Korea town with nowhere in particular in mind. I’d just tried to get in to another very popular Korean place a few doors down but it was packed out. Know where you’re going and arrive early is the lesson. As usual, the meal started with Panch’an (or Banchan); a host of little vegetable dishes. These included classics such as Kimchi (fermented napa cabbage), Kongnamul (cold boiled bean sprouts with sesame oil) Sigeumchi Namul (lightly parboiled spinach dressed with sesame oil, garlic, and soy sauce), Gaji Namul (boiled aubergine), Musaengchae or Muchae (julienned white radish in a sweet vinegar sauce), and Oi Sobagi (cucumber kimchi, stuffed with chili, spring onions and buchu (Asian chives)), plus a couple of others I didn’t recognize. For my main I had Beef Bibimbap, another favourite. Literally meaning ‘mixed rice’, bibimbap is warm white rice topped with more Namul (sautéed and seasoned vegetables), Gochujang (chili pepper paste), soy sauce, or Doenjang (a fermented soybean paste), and typically Bulgogi (marinated and grilled sliced beef). It’s usually served in a hot stone or metal bowl with a raw egg and the whole dish is stirred together thoroughly just before eating. It was okay here but not amazing (B). To drink I tried OB Premier Pilsner, a Korean beer masquerading as a German pilsner which, just like all the other Korean beers I’ve ever tried, is absolute piss water (C-). Shame they can’t sort this out. I love Korean BBQ restaurants and according to Time Out, this is one of the best ones. It’s quite modern with individual smoke vents for each circular table grill. Once again, the Panch’an was the first thing to arrive. As it was relatively quiet I got excellent personal service from the waitress who sat and chatted with me while she grilled the food. She taught me that you should start with the fatty meat to oil the grill, and also that it’s quite okay to grill the Kimchi as well. The food was good (B/B+) but the draught beer was completely flat and I sent it back (D). I later switched to Soju (Korean shōchū) but that wasn’t much better (too sweet, C-). The final bill came to HK$583. So, an okay place, but I know it can be better. More research required. This is a Korean-American gastropub that serves fusion bar snacks from both countries. I had the Bulgogi Sliced Beef Steak Slider with onion, garlic and jalapenos, and the Kimchi Fries with mozzarella and the spicy house sauce, and another side of Kimchi for good measure (all B). Lots of soju drinks here as you’d imagine, many of which have been infused with fruits in-house. I had the Soju Margarita which was nice (B). With a bottle of Tsing Tao the bill came to HK$358. A cosy, unpretentious place with a friendly welcome. I came here as it was just around the block from where I’m working, but it got on my map due to its inclusion in CNN’s list of ‘ 40 dishes we can’t live without’. The dish in question is the Shrimp Sashimi; raw prawns served with raw garlic and chilli on a bed of ice. It was a first for me, but I can’t say I was that impressed (B) as they don’t taste of much. I’m sure other things on the menu are good though. So that’s it for the food. Bars and boozing next! Occasionally my job took me out of the city to more far flung areas such as the market town of Tai Po, forty five minutes due north of Mongkok on the MTR. Although its roots are much older, Tai Po was developed as a ‘new town’ in the 70s and now has a sizable population of 320,000. After work I went to the market, which is about twenty minutes-walk from Tai Po Market station. Bourdain had eaten noodles here at Ping Kee (stall CFS12/11) but sadly I was too late to catch them open. I carried on walking for another five minutes and eventually came to Tai Ming Lane Square which I presume is the town’s central square. Bourdain visited a famous (since 1957) roast goose restaurant here. It’s very hard to miss due to the neon signs and the roasted meats in the window. They also do Char Xiu (barbecued pork) and Xiu Yoke (roast pork) but it’s the Fung Kon (air-dried roast goose) that’s the most famous (they rear their own). You can also get combination plates of all three meats, but I was here for the goose. In autumn 2017 a whole goose cost HK$460 whereas a half, which I went for, was HK$230, approximately £23. You can also get a quarter for HK$130 or HK$110 depending on the cut. It was great, some of the best I’ve ever eaten (A). I also had some Choi Sum, a bowl of rice and a beer, all of which pressed the right buttons (B+). My only regret was not asking for the greens to be cooked in the local oyster sauce which I have since learned is very good. Lee Kum Kee, whose founder invented the sauce, has its headquarters here. The service was fine, but only the cashier (owner/manager?) could speak English, so I did a lot of pointing and showing of photos to get what I wanted. They also have a branch in Central which I’d like to visit next time. Back in 2006 one of my best foodie experiences here was on the island of Cheung Chau which I understand to be the last actual working fishing village in HK (most seafood is imported). You can get there on a fast ferry in 35 minutes from Pier 5 in Central, or a slower one which takes 55 minutes. After I finished work the British expat school owner (married to a local, so he knew his stuff) directed me to one of a row of seafood restaurants on Cheung Chau Family Walk (I think it was Hang Lok at 13 Pak She Praya Road) where I had two amazing fish dishes, the steamed fish with black beans, spring onion and ginger sticking in my mind most of all (A+). Fantastic food in a blissful setting by the waterside looking out to sea. Also, in 2006 my friend Ethel and I took a ferry to Sok Kwu Wan village on Lamma Island (30/40 minutes to Sok Kwu Wan village from Central Pier 4) and did the nature walk over to the other side of the island to Yung Shue Wan and took the ferry back to Central from there (27 minutes). The walk was very pleasant as it was a nice sunny day (take sunscreen and water). It took a couple of hours and we saw lots of butterflies and took in a few nice views along the way (photos lost sorry). We had a bite to eat in Yung Shue Wan while we were waiting for the ferry back. I don’t recall the name of the restaurant but I’m guessing it was Sampam Seafood. We had a nice view of the sea and the food was okay (B). So, contrary to popular perception HK is not just a city, there are heaps of natural escapes just waiting to be explored. Continuing my reviews of Chinese restaurants (see previous posts for Dim Sum, Noodles, Western Comfort Food, Food with a View and Kowloon restaurants) here’s my experience of eating on Hong Kong island. Google map here. Hipster Fusion Buns – Little Bao (Intermediate A). Chili Crab – Under Bridge Spicy Crab (High Intermediate A). Cheap Eats – Tung Po (High Elementary B). Posh Cantonese – The Chairman (Advanced B). Chiu Chow Cuisine – Leung Hing Restaurant (Intermediate B). Roast Goose – Yung Kee (Intermediate C). I love Little Bao, it’s the kind of place I’d like to open. When I was in town in Autumn 2016 it was the buzz name on everyone’s lips, along with Yardbird, another hipster joint just down the road. As you can imagine it’s very popular and quite difficult to get in (no reservations allowed). I managed to on the second attempt by arriving early and putting my name on the waiting list. The greeter took my number and called me 40 minutes later when a table was free. Fortunately there are plenty of bars further along the street where you can kill time (see my coming post on Bars). The restaurant is open plan with diners sitting at an L-shaped bar right in front of the chefs so you can get a birds eye view of all the action. Video here. Little Bao is actually a fusion joint. It takes the burger concept and gives it a twist by using steamed Chinese baos instead of burger buns. There are three versions; pork belly, Szechuan chicken, fish tempura and vegetarian. I tried the first two (they’re quite small) and loved them both (A+/A). I had the Truffle Fries as a side; Shiitake tempeh with truffle mayo and pickled daikon, also great (A). They make decent cocktails too. I had a Punch Sai Gua (gin, watermelon, cucumber, cinnamon and lemon) and Chris’ Lemonade (42 Below Vodka, Chrysanthemum, honey, rhubarb bitters), both scoring B+. To finish, the LB Ice Cream Bao was delightfully delinquent. A deep-fried steamed bun sandwiching green tea ice cream and drizzled with condensed milk, which was killer obviously (A+). The bill came to HK$541 for six items which isn’t too bad. Lots more to try on the menu. Wish I could go back! Before the 1990s Hong Kong’s typhoon shelters (protective harbours for boats during rough seas) were home to a large community of fishermen and boat people who over time developed their own distinctive culture and cuisine. Since then these communities have slowly declined, along with the fishing industry, and their descendants have moved onshore, some of them opening food stalls which developed into restaurants like this. This particular restaurant, under the Canal Road flyover, gets an entry in Where Chefs Eat and a slot on one of Anthony Bourdain’s programmes. They are open till 6am but I went around 9pm and I got a table without any problems, despite it being quite busy. I kicked off with a big plate of Steamed Clams with Chilli and Black Bean Sauce which were great (A). The iconic dish of typhoon shelter cuisine is Typhoon Shelter Crab and it’s the signature dish here (on the menu as Under Bridge Spicy Crab). If you order it your victim will be brought to the table for inspection before being dispatched to the kitchen for deep frying. The house recipe is secret but it certainly contains lots of fried garlic and chilli peppers, which are offered at six levels of spiciness from ‘no spice’ to ‘super spicy’. I went for ‘medium spicy’ although with hindsight I think I could have handled ‘very spicy’. I loved it (A). Although it was a bit expensive (this varies by season) I really enjoyed the food and would happily go back, preferably in a group. One useful comment on TripAdvisor has these two caveats: “First, if you are in Hong Kong in the fall you may want to consider a hairy crab restaurant [as they’re in season] and second if you plan to visit an outer island or a seafood oriented cooked food centre like Mui Wo the better value and equally delicious meal is a salt and pepper crab. The salt and pepper dish uses smaller crabs, so less meat, but I thought the meat was sweeter and the seasoning a better compliment”. The restaurant also offers the option of dining on an actual boat, which is what Bourdain did, but it costs around HK$2,000 and you need a minimum of six people. This is one of a few inexpensive, no-frills restaurants in the cooked food centre on the top floor of the market building on Java Road. It’s very popular and attracts big groups of diners who create quite a raucous atmosphere. I started with the Deep-Fried Tofu which was pretty average (C). The Chinese Cabbage with Garlic was okay (B). Bourdain really liked the Black Squid Ink Spaghetti which he described as “amazing.” I thought it was good (B) but nothing I’d make a TV programme about. Your beer drinking custom is touted for by beer girls promoting the Carlsberg and Blue Girl brands. Unfortunately I’m a fan of neither (C). So not the greatest culinary experience but the atmosphere is great, which makes this a good place to come with a gang for a fun, cheap night out. Another quintiessential experience is eating at a Dai Pai Dong; an outdoor food stall that serves ‘wok hei‘ dishes. Sing Kee is a famous dai pai dong in central which I stumbled across one night. The food was okay (B) but the atmosphere is what made the experience special (A). This is a high-end place in fashionable NoHo (north of Hollywood Rd) which specialises in local, seasonal Cantonese cuisine. It comes recommended by 1001 Restaurants You Must Experience Before You Die and Where Chefs Eat. It’s best to reserve; I got in for lunch on the second attempt. I wanted to have their most famous dish of Steamed Flower Crab but couldn’t justify the expense at the time, so I went for the set ‘Executive Menu’ instead where you can choose three (HK$198) or four (HK$218) dishes from quite a wide selection for each course. I’m always up for trying new things so I began with Smoked Baby Pigeon with Longjing Tea and Chrysanthemum (B). I quite enjoyed the Sichuan Style Shredded Pig’s Ear & Tripe Salad with Freshly Sliced Guava (B+). The Tea Smoked Duck with Tamarind and Dark Sugar was interesting (B). Finally, Osmanthus & Wolfberry Ice-cream (B+). Osmanthus is a flowering plant with a scent and flavour reminiscent of peach and apricot which is often used in tea. Wolfberry, also known as Goji berry, is similarly used in teas, and many other dishes, primarily for its (fictitious) health qualities. An interesting experience but not mind-blowing. It would probably be much better if you’re prepared to spend more. This is a good place for business lunches on expense accounts. A very local back street place specialising in Chiu Chow (or Teochew) food, a regional cuisine from the north east of China, known for its shellfish and vegetarian food, and with a reputation for being very healthy. I had the seafood noodles which were excellent and very reasonable. Just wish I’d been hungrier so I could have tried more dishes. A famous Cantonese institution known since 1942 for its roast goose (they farm their own) and dim sum (served 2-5pm). We found it difficult to get in and had to wait a while, maybe reserve if you can. Sadly our choices were ill-informed and we didn’t enjoy it very much, but that’s not to say it can’t be good. Next time I will get the goose rather than the thousand-year-eggs! More far flung Chinese restaurants next! They’re all on this Google map. Aficionados, please don’t hang me for any comments you might feel are a bit negative, I’m still learning! These first two places are accessed from MTR Sham Shui Po Station via Exit B2. The second place is on the street corner on your immediate right as you come up the stairs. The first place is also on the right, about half a block up Pei Ho Street. If it’s authenticity you’re after then this is the place! Mentioned in ‘1001 Restaurants You Must Experience Before You Die’, it’s well off the tourist track in Sham Shui Po, just to the north west of Mongkok, but definitely worth the trek for tofu lovers like myself. Pei Ho Street has a busy street market so the front of the business sells directly to passing trade. You can also sit inside and eat. From top right, I had the Deep Fried Tofu (B+), Curry Fish Ball (B), Deep Fried Golden Fish & Soya Cake (B) and the Tofu Pudding (B+). I enjoyed the Deep Fried Tofu the most. The cubes of tofu are topped with fish paste before frying. I like it with a bit of sweet chilli sauce. I also really enjoyed the Tofu Pudding (tofu fa) for which they are famous. In HK it’s usually served while it’s still warm with a bit of sugar or ginger syrup on the top. This little corner shop is famous for Bowl Pudding (put chai ko) which they’ve been making since the 60s. The puddings are made with glutinous rice flour, wheat starch and sugar, sometimes with the addition of red beans, and then steamed. I arrived a bit late in the evening so they only had the bean version left (B). Hong Kong is famous for its street food and this stall has a very good reputation. In particular it’s a good spot to try Fried Pig Intestine. I quite liked the contrast of the crunchy outside with the softer interior (B). Mustard, hoisin or plum sauce are good condiments to have with it. I also tried their Stinky Tofu (left and right in the foreground in the pic below), another classic HK street food for which this stall is famous. 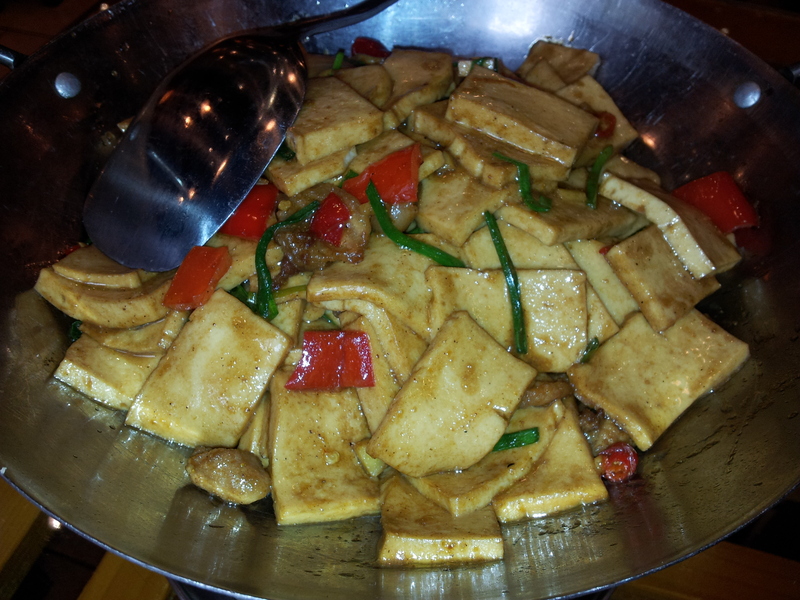 The tofu is fermented in a brine of milk, vegetables, meat and/or seafood juices for several weeks, and then deep fried. As you can imagine the aroma is quite pungent but it tastes better (B) than it smells! Another famous Hong Kong food you should try is Claypot Rice. This place near Temple Street night market has such a good rep for it that it evolved from a street stall into an indoor restaurant. There’s nothing fancy about it, in fact the interior walls all appear to be shower curtains. It’s very popular so to avoid the long queues either arrive early at 5pm or late at 9pm. I began with a couple of deep-fried Oyster Cakes, another much-favoured local delicacy (B). When the hotpot arrives on the table, you should pour a bit of soya sauce on it, replace the lid and wait 3 or 4 minutes. Then take out the toppings and give it a good stir. I opted for the Sausage & Chicken Rice. I really liked the chicken and the rice (B+) but I couldn’t handle the sausage which to me had a very strong, almost chemical taste (D). I did try Chinese sausages in other places later and found them more palatable though so maybe I just don’t like the ones here. More research is needed. This is a very popular Hakka restaurant near the Royal Plaza Hotel. It’s one of those big Chinese restaurants with lots of round tables. There were a fair few people waiting when I went but I got in quite quickly as a lone diner, even got my own table. The Hakka are a sub-group of the Han Chinese who are some of the earliest immigrants to the region. Hakka cuisine is characterized by an emphasis on texture and very simple flavouring. I tried a couple of Hakka classics here. The Deep-Fried Fresh Milk was interesting (B). And the Salt-Baked Chicken was quite nice too (B). I would have liked to try more dishes but, with a plate of stir-fried greens, this was more than enough. Enlist some help when you come here if you can. I came here with my friend Kelvin who is a vegetarian. He’d been finding it quite hard to eat well on the mainland so I brought him to this popular spot for a tofu and vegetable feast. Generally veggie restaurants are quite hard to find in China but they do exist, mainly to service the large Buddhist community. The Happy Cow website is a good resource for finding them. We tried quite a few things, some better than others. We really liked the ‘Deep-Fried Eggplant with Teriyaki Sauce’ which had just as much depth of flavour as any meat dish (A). We coveted what the French couple on the next table were eating and ordered it ourselves by pointing as we couldn’t find it on the menu (show them my photo if you want to order it). I think it’s deep-fried tofu, although the translation mentions mung beans. This was our favourite (A+). The ‘Golden-Fried Tofu’ was okay (B). However the ‘Beijing Style Smoked Vegetarian Goose’ looked good but didn’t really cut it (C). Kelvin liked the ‘Black Truffle Scramble’ (sautéed fresh milk with egg white and Italian black truffle), more than I did (C-). Truffles are always good but the marriage with broccoli didn’t work for me, especially visually. It does taste better than it looks though. So some choices were a bit hit and miss but there are definitely some great dishes to be discovered here. Perhaps the most famous Peking duck restaurant in town, you have to reserve well in advance but may still have to wait a while, 30 mins in our case. The service is offhand, verging on the downright rude, in classic Chinese restaurant style (think Wong Kei, Soho) but the duck is very crispy. Even more Chinese restaurants on Hong Kong Island next! Generally I tried to make a point of avoiding Western food during my visits to HK although there are undoubtedly many fantastic, and very expensive, French and Italian restaurants here. So by ‘Western comfort food’ what I generally mean is Hong Kongified desserts, sweets and bakery items, along with the odd baked potato. Many of these places are what is called a ‘cha chaan teng’, literally a tea restaurant. You’ll find everywhere mentioned on this Google map here. The Pineapple Bun or ‘bo lo bao’ (corrupted to ‘polo bun’) is a Hong Kong institution, so much so that in 2014, the local Government listed the pineapple bun as ‘a part of Hong Kong’s intangible cultural heritage’. Hong Lin is one of a few cafes that is famous for its buns. I had mine with butter which is known as ‘bo lo yaa’. The bun is the perfect complement to milk tea, a British influence originally but now a much stronger brew made with Black & White full fat evaporated milk. It wasn’t a looker but it was very tasty (B). If you’re brave you could try their Yuenyeung, a hot or cold drink made with three parts coffee to seven parts milk tea. This place is also famous for its pineapple buns however I came to try their French Toast at the urging of my friend Dominque who has local ties. French toast is another sweet treat beloved by Hong Kongers and according to Foursquare, this is one of the best places to try it. I wouldn’t disagree (B+). Another legendary place, established in 1970 by a local man who had worked on a farm in Australia in the 40s, hence the name. Service is famously unrefined (brusque but efficient for me) but people put up with it for the sake of their renowned Milk Puddings which are stacked up in the window sills (A). Their scrambled eggs are also famous (A) even if the soft white bread they are served on was a bit too retro for me (B-). Iced milk tea makes a nice change (B). This dispenser of baked goods is actually a stall rather than a shop as such. For thirty years it has been a local institution and has even garnered a Michelin recommendation. Personally I don’t see what all the fuss is about. I tried the ‘Baby Chicken Cakes’ but found them quite dry and uninteresting (C+). I enjoyed the ‘Wife Cakes’ more (made with a filling of winter melon, almond paste, ground sesame, and five spice powder) but still wasn’t completely wowed (B-). Next time I might try the glutinous rice cakes with red bean paste or the Egg Tarts. For American style cookies, a very famous company with branches all over HK is Jenny Bakery. I can also recommend their main competitor, Mrs Fields Cookies, which has outlets in many of the MTR station. Their Sugar Butter and Chocolate Chip cookies are dangerously moreish. Another sweet snack much beloved by locals is the Egg Waffle, or mini egg cake, known locally as ‘gai daan tsai’. This place in North Point has the rep for making some of the best as the many press clippings covering its walls show. It’s just a hole in the wall but easy to find as there’s usually a queue outside. There are now eight branches but it’s this one that attracts all the attention. I enjoyed mine but it’s not something I’d get religious about. The exterior was nice and crunchy but I thought it was a bit too dry on the inside (B+). Tsui Wah is the Hong Kong version of an American diner, described by some as ‘the Denny’s of Hong Kong’. Established in 1967, they have now over thirty locations (some open for 24 hours). Despite being a chain, each branch has its own character. I particularly like the 70s retro stylings of the Yau Ma Tei branch. My own house is also filled with moulded plastics from past decades so I feel quite at home here. You can get a pineapple bun and milk tea here too but the extensive menu has a varied and reasonably priced choice of fusion dishes from Cantonese, Western and other Asian cuisines. I had the Indonesian dish Nasi Goreng which wasn’t a pretty sight but it pressed all my comfort food buttons. Tsui Wah is not fancy in the slightest, but it’s defintitely an experience, as recommended by Frommers, Where Chefs Eat and Anthony Bourdain amongst others. A Michelin-recommended Baked Potato stall! Michelin have only recently arrived in HK and they are sensitive to the charge of being elitist so they have gone out of the their way to suggest more accessible eateries such as this. I had the sour cream and cheese baked potato which was great (B+) but it’s just a potato at the end of the day. If you find this a bit too bland, the more daring among you can pop around the corner to Delicious Food for a slice of grilled pig intestine on a stick (see next post). I love hilly cities, and Hong Kong has some stunning vistas. I went to several places just to catch the view and this post is just for them. They’re all on this map. The tallest building in Hong Kong is the International Commerce Centre (ICC), in Yau Ma Tei with 118 floors making it 490 meters high. Built in 2010 it’s the tenth highest building in the world. Its position at the western entrance to Victoria Harbour means that it has fantastic views over most of Kowloon and over to Hong Kong Island. It was a bit hazy on the day I went but you could still see a lot. Immediately over the water from it is the second highest building, the International Finance Centre (IFC), which you can just about see on this photo. A very posh restaurant that I probably couldn’t afford or get into in the evenings, but they did a relatively cheap set menu for lunch (HK$440 including the service charge, around £43). I was seated in the bar area rather than the main restaurant but I still had a pretty good view out over the harbour. It must look even more amazing at night. I kicked off with a well-made mojito. I remember the food generally being very nice (B/B+) but I didn’t grade the dishes sorry. ‘Steamed Pork Dumpling with Sliced Abalone’, ‘Turnip Cake with Dry Shrimps & Preserved Sausages’ and ‘Deep Fried Taro Cubes’. ‘Shredded Bamboo Shoot in Sichuan Style’. ‘Winter Melon Ball with Hawthorn Sauce’. ‘Double Boiled “Dragon Seal” Soup’. ‘Grilled King Fish Fillet with Herbs’. ‘Stewed Vegetable with Fresh Bean Curd’, the veg being pak choi (loved this). ‘Fried Rice with Minced Wagyu Beef’. The food was lovely visually, and the flavours were pretty good overall, but not amazing. A visit to the loo provided some great views from the other side of the building. Click to enlarge. You can see videos here and here. After lunch I was planning to go to the Ozone Bar www.ritzcarlton.com, on floor 118 which is technically the highest bar in the world, but discovered it wasn’t open until 5pm. I could also have gone to Sky100, the viewing deck on the hundredth floor, but forking out around £16 for a similar view to the one I’d just had in Dragon Seal one floor above didn’t appeal once I did the math. Admission to Sky100 costs more than a drink at Ozone, and Ozone is eighteen floors higher. It’s a shame that you can’t have similar experiences over the harbour at the International Finance Centre (IFC), but it’s almost entirely given over to offices although when writing this (ie too late) I discovered the 55th floor is open to the public. The IFC complex is actually two towers (known as 1IFC and 2IFC), a hotel and a shopping mall. 2IFC is the taller tower of the two and it’s my favourite skyscraper in HK. I just love its sleek lines. If you take the lift up to the roof of the IFC Mall you’ll find a few bars and restaurants that have great views over the harbor, and of 2IFC towering above you. This Conran designed restaurant gets an entry in ‘1001 Restaurants You Must Experience Before You Die’ which praises the food (Cantonese classics) very highly. I was mainly here for the views though. Click to enlarge. To keep costs down again I went for lunch and had the set menu for HK$298, about £29. Also again, I didn’t grade it, but it was very good (B+/A). I began with ‘Honey-glazed Barbecued Kagoshima Pork’. And followed on with ‘Steamed Pork Dumplings with Porcini’ and ‘Steamed Mushroom Dumpling with Bamboo Piths’. ‘Baked Whole Abalone Tart with Diced Chicken’. ‘Braised Fish Maw Soup with Shredded Sea Cucumber, Mushroom and Bamboo Shoots’. ‘Steamed Garoupa Fillet with Yunnan Ham and Shredded Mushrooms’. ‘Wok-fried Seasonal Vegetables with Garlic’. ‘Fried Rice wrapped in Lotus Leaf’. And a nice healthy dessert, the name of which I don’t recall, sorry. The cocktails are good here too. All the food was great. I just wish I was rich enough to explore their à la carte offerings which must be amazing. This last place is a restaurant but you can treat it as a bar as most people do. I haven’t heard anything about the food except that they do free bar bites during their ‘Sunset Hour’ (6-9pm) when it’s also 30% off Martinis. You’ll need to arrive earlier than that to snag the better seats on the bar terrace. They all have stunning views of lower Kowloon and Hong Kong island on the other side of Victoria Harbour. You get a great view of a residential skyscraper nearby called ‘The Masterpiece’. I would kill for one of those apartments! The view looking up at The Masterpiece is quite impressive too. This very posh hotel restaurant is apparently the place to watch fireworks on NYE. I went in 2012 for a pricey drink at the bar and the view at night is stunning. The Starck designed loos also have fantastic views of the downtown cityscape. More about architecture in later posts. I visited Hong Kong for the second time in Autumn of 2016. People who know me well know that I’m a hopeless noodle addict, and I’d probably choose a noodle soup over any other meal. Imagine then how excited I was at the thought of trying all the possibilities in Hong Kong, not only the indigenous noodle dishes but all those from other Asian cuisines as well. Below are a few of my favourites. You can find them on this Google map. Probably the most famous and commonly available Chinese noodle soup is Beef Noodle Soup. In Hong Kong some restaurants distinguish between Beef Noodles (牛肉麵) which are made with slices of beef or beef shank, and Beef Brisket Noodles (牛腩麵) which contains only brisket. I’m all about the brisket. A great noodle shop near the Royal Plaza Hotel. The guy who owns it is obviously a bit of a character! There are lots of pics of him with various celebrities on the walls. Anthony Bourdain came here for one of his shows and loved the Beef Brisket Noodles. I agree, they’re great (A). I need to come back to try the wontons. This is probably the most famous place for Beef Brisket Noodles in Hong Kong. I read about it in ‘Where Chef’s Eat’ and ‘1001 Restaurants You Must Experience Before You Die’. It’s opposite this funny little place on the steps. Next to it you’ll see the permanent queue along the street. I went after the lunch time peak and waited about twenty minutes. It was definitely worth the wait . The brisket might look tough but it’s been stewed for hours till it’s really tender. Great flavours (A). They have a curry flavour option as well which would be interesting to try. The next local bowl to try is Wonton Noodle Soup. In Cantonese cuisine wontons are filled with minced pork and shrimp and served with noodles in a soup typically made from boiled shrimp shells, pork bones and dried flounder. Mak’s are probably the most famous purveyors of wontons in Hong Kong. They are a small chain with many imitators due to feuds in the family. I went to their Jordan branch for a late morning snack and was seated pretty much straight away. I had the wonton noodle soup which was sublime (A+). Their unique wontons contain half a shrimp tail in a paste of egg and powdered dai di (flounder), while the broth is made from dried shrimp, flounder and pork bone. The only downside is the portions are tiny and more expensive than elsewhere, but then they are the best. Another famous wonton institution, with a Michelin star, on the top floor of a shopping centre. I had the good fortune to be working nearby so I came for lunch a couple of times. It’s so busy they have a greeter on the front door issuing tickets. Fortunately as a solitary diner I got in fairly quickly. … or dry, in this case with some bok choi and hoisin dipping sauce. I tried both over two visits and they are excellent (A). There’s lots of other good looking stuff on the menu. A local ramen institution, since 1987. They are named after a famous sumo wrestler which is making quite a statement. Time Out would have you try their Yokohama curry ramen, with tomato, bacon and parmesan cheese but I’m a stickler for tradition and went with their Kyushu Ramen, a classic style made with Tonkotsu pork bone broth. And a rack of gyoza on the side. So, so good (A). A small citywide ramen chain that began in 1984. They too are famous for their Tonkotsu soup which is my favourite style. I had the classic Soya Sauce Ramen which was great (A). So top marks all round! Hong Kong is heaven for noodle lovers. Dim Sum are small snack-sized portions of food. Most commonly these are steamed or fried dumplings and buns, with meat or seafood fillings, but can also include steamed green veg, roasted meats and soups and desserts such as custard tarts. Eating dim sum is a Cantonese tradition, originating in Guanzhou, which overlaps with the older Silk Road tradition of Yum Cha (tea drinking). Typically the occasion is a shared family brunch at the weekend although nowadays dim sum can be eaten at any time, and often as takeout. The ideal number of people to eat dim sum is four, as many portions have four items. In restaurants they were traditionally served from trolleys pushed around the tables but in more modern, often smaller places, food choices are made via a tick box menu. There will also be a wide range of teas to choose from which will often include Green, Black, Chrysanthemum, Oolong and scented teas like Jasmine. Alcohol is rarely served. In Hong Kong yum cha is very popular and there’s a big dim sum restaurant scene. Here are five excellent places I’ve been to. They’re all different, and I like them all for different reasons. The first three are all innovative newcomers, the fourth is an ancient institution and the last is a big posh palace with a view of the harbour. My Google map is here. The first two places are two branches of the same company, Tim Ho Wan, which now has 45 branches worldwide. The Sham Shui Po, North Point and Tai Kok Tsui branches all have one Michelin star. Tim Ho Wan get props from sources I respect like Anthony Bourdain, Where Chefs Eat and Eat Like A Girl. In fact in 2009 they got international accolades for being the world’s cheapest Michelin star meal. Expect queues at peak times. This was my first experience of dim sum in HK. I was attracted by the rep and this particular branch because it’s a short taxi ride from the Royal Plaza Hotel where I was staying. I was expecting a queue but was seated straight away, although I had a family join my table soon afterwards. One of my favourite Cantonese food items are Chāshāo Bāo 叉燒包, Barbecue Pork-filled Buns, which come in two forms; steamed, white and fluffy or baked, golden and glazed. At Tim Ho Wan they serve the latter, (Chāshāo Cān Bāo 叉燒餐包) with a sugary glaze, which has made them the most famous item on the menu (A+). I also love their Shāomài 燒賣, Steamed Pork Dumplings with Shrimp (A). 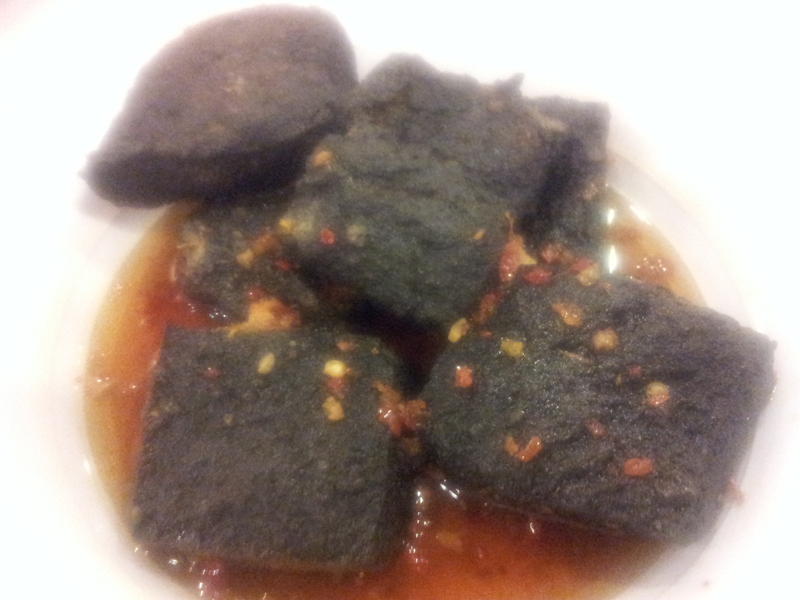 The Steamed Spareribs (Páigǔ 排骨), served here with Black Beans (Dòuchǐ 豆豉), are very good (B+). Luóbo Gāo 蘿蔔糕, Pan-fried Turnip Cake, is another favourite of mine, made more flavoursome here by the inclusion of dried shrimp (A). Chángfěn 腸粉, Rice Rolls, can be eaten plain but the ones on the menu here are stuffed with BBQ pork (A). Another branch, also with its own Michelin star. I walked straight in without queueing. The menu is a couple of dishes longer and the desserts are different. I tried a few different things this time. Phoenix Claws (Fèngzhuǎ 鳳爪) is the euphemistic name for chicken feet which have been deep fried, boiled and then steamed. Often, as here, they are served with black beans. I’m slowly learning to appreciate them, but I’m not completely there yet (B). The Wontons in Chilli Sauce were pretty good (B+). The Pan-fried Green Pepper with Mixed Fish and Pork was a new dim sum to me (B+). I also enjoyed the Steamed Rice with Chicken and Chinese Sausage (B+). It had two kinds of sausage, one with blood and the other without, both of which were less challenging than the ones I’d have with my claypot rice at another restaurant. In 2011 this restaurant won the Time Out Food & Drink award for the best dim sum in HK and in 2012 they were listed by Newsweek as one of the 101 Best Places to Eat in the World. I knew of them via the 2013 edition of Where Chefs Eat. The location is slightly off the beaten track in Jordan but it’s worth the walk from the station. They have a rep for innovative, unusual dim sum and I was immediately drawn by their Steamed Rice Rolls with Black Truffles and Mixed Mushrooms (A). That didn’t stop me ordering perhaps the most common dim sum of all, Har Gow 蝦餃, translucent steamed prawn dumplings, which I adore (A). I liked their Chicken Feet and Spareribs on Steamed Rice because the smaller portion means all the feet get eaten when ordered by timid Westerners like me (B+). They are well known for their cute Pineapple Buns with Custard Filling (A) which feature in the savoury section of the menu for some reason. Where Chefs Eat recommends the house specials like Pan-fried Tofu Skin with Chicken and Cumin, or the fried ‘9 Dishes’ with Pig’s Blood and XO Sauce, Steamed Tripe with Black Pepper Sauce, and for dessert, the Sesame Seed Balls but many of these weren’t on the menu when I went. So, make sure you ask what specials are on that day. Overall, excellent food and very reasonably priced. I urge you to go. This venerable institution was established in 1933 but moved to its present location in 1976. It doesn’t seem to have changed much since then. The décor has an Art Deco feel with wooden booths, ceiling fans, and stained-glass windows. They get props from the Eat Like A Girl blog and in Where Chefs Eat they are described as one of the best places in HK for dim sum. They also get extra points from me for serving beer. The menu is also very retro and included many hard-to-find items, and there’s nothing bite-sized about their portions. Take for example the Steamed Jumbo Sized Chicken Bun (B) which could easily have fed four. I also found the ‘Steamed Shumai topped with Pork Liver Slice’ to be quite unsubtle in their presentation, but the flavours were good (B). My favourite was the Lo Mai Gai 糯米雞 or Steamed Fried Rice with Shrimp wrapped in Lotus Leaf (B+). Finally some Egg Tarts to finish (B). The service has a reputation for being notoriously rude but I have no complaints about my chap who was friendly and attentive. So not the best or the most reasonably priced food, you’re effectively paying for the history and tradition, but it’s still a good experience that I would recommend. In 2002 a businessman was assassinated by the Triads in here but don’t let that put you off, they’re not after you, are they? …and the opulent surroundings merit the palace moniker. I had the Har Gow 蝦餃 steamed prawn dumplings once more because I love them so much (A). And of course the Chāshāo Bāo叉燒包, steamed BBQ pork buns again (A), along with the Steamed Ribs with Black Bean Sauce (B+). Also the Chángfěn 腸粉 Steamed Rice Rolls with Shrimps were good (A). The only dim sum I had here that aren’t mentioned above were the Xiǎolóngbāo (饺子). Also known as Shanghai dumplings due to their place of origin, these are pork-filled ‘soup dumplings’ (they can contain seafood but not usually) which flood your mouth with juicy rich broth when you bite into them (A). Here, the hole in the top allows you to top them up with blended vinegar and soya sauce. My only gripe was that I was rather abruptly hassled to pay the bill while I was still eating which earned them a minus mark but otherwise it was a great experience. Obviously as a single diner, the amount of different dim sum I can try at any one time has its limits so apologies if I haven’t covered a more comprehensive range of dim sum, there are many more. Hopefully though I’ve given you a good range of the best things to try. Go with a gang if you can. 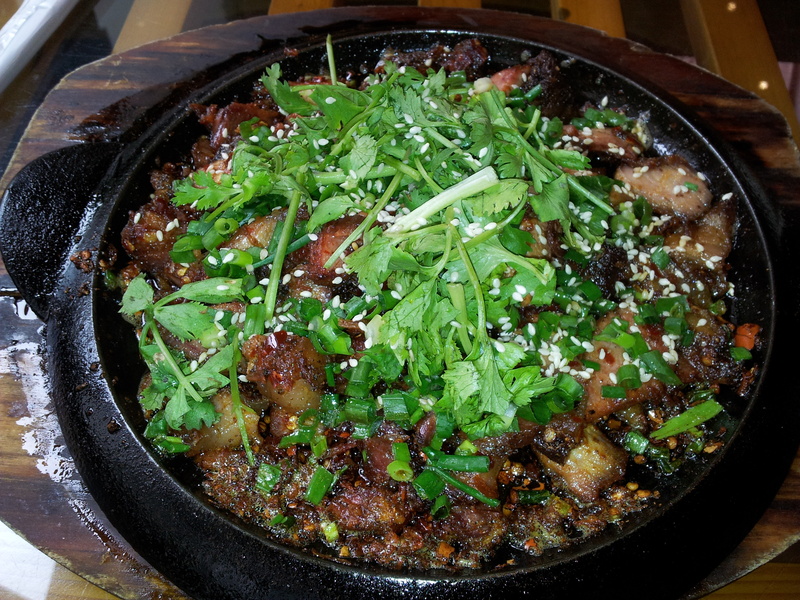 Changsha is the capital city of Hunan, a province famous for its fiery food. According to Wikipedia, it differs from neighbouring Sichuan province in “its liberal use of chilli, shallots and garlic, Hunan cuisine is known for being dry hot (干辣) or purely hot, as opposed to Sichuan cuisine, [which is] known for its distinctive mala (hot and numbing) seasoning and other complex flavour combinations, [and] frequently employs Sichuan peppercorns along with chilies which are often dried, and utilises more dried or preserved ingredients and condiments. Hunan cuisine, on the other hand, is often spicier by pure chili content, contains a larger variety of fresh ingredients, and tends to be oilier. Another characteristic is that, in general, Hunan cuisine uses smoked and cured goods in its dishes much more frequently”. I had just two days here and only managed to get downtown on one occasion. The main entertainment district seems to be on the eastern bank of the Xiangjiang river, south of Juzizhou bridge and around its continuation Wuyi Avenue. The area has lots of glitzy shopping centres, branded shops, night clubs and eateries of all kinds which attract all ages but especially the young. 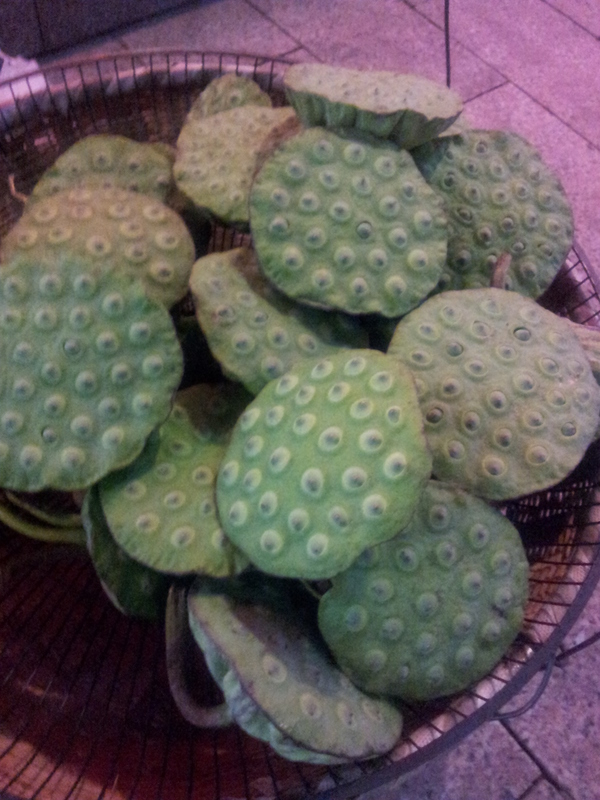 A lot of street hawkers were selling this strange vegetable. Can anyone tell me what it is? Next to the river is the Xiangjiang Scenic Belt, a riverside walk where people go to listen or take part in outdoor karaoke. I enjoyed wandering around here just people watching. I went to this Wikipedia webpage and took a photo of the ‘list of notable dishes’ from Hunan with their English/Chinese translations. In the restaurant I just zoomed in on the dishes I fancied eating and showed them the Chinese translation.The waiting staff were ever so relieved they didn’t have to communicate with me verbally (the source of surliness in some places?) and I got quite good service. The other diners that I was sharing my circular table with were gobsmacked at what I managed to get and I got several smiles as a result. Ah, the wonders of technology. On one occasion I had Changsha-style stinky tofu or Chángshā chòu dòufǔ or 長沙臭豆腐长沙臭豆腐 This dish is prepared by soaking the tofu in a brine and fermenting it for a number of months. Different styles take different colours but the Changsha version is coal black. It’s said that the more the tofu smells the better it tastes but the stuff I had didn’t have a strong odour and tasted fine (B+). It came with a spicy sauce but wasn’t too hot. I also had another famous local dish; shredded pork with vegetables or nóngjiā xiǎo chǎoròu or 農家小炒肉农家小炒肉. Again a bit of spice but not too much. I loved the whole cloves of garlic though (B+). I’m so sorry but I don’t recall the name of the restaurant I went to, and have lost my notes, but there are a few specialising in Hunanese food on Tripadvisor you could try. I was staying at the Grand Sun City Hotel (Block 3, 269 Furong Middle Road). I received good service here from most of the staff, though not many of them spoke English. In terms of facilities, they have a large triangular pool and a basic gym with a couple of fair-sized running machines. The breakfast is ok but limited for Westerners as is usually the case. 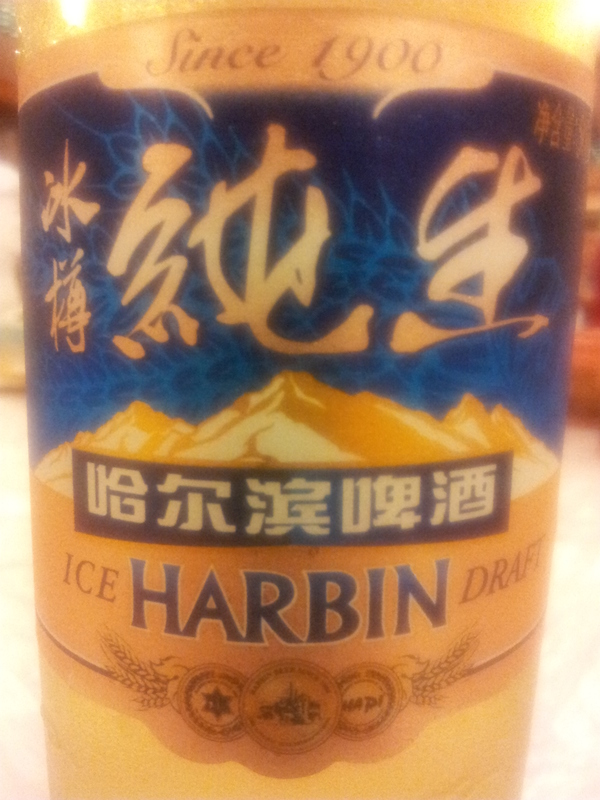 The fried rice, pak choi and cold Harbin beer that I had in their Chinese restaurant was fine (B+). Go early though as you may be the only customer and they will want to close as soon as your done. There’s not much in the way of things to do in or near the hotel but, if listening to the usual piano recital in the lobby isn’t your thing, it’s only a short taxi ride to the downtown entertainments district. Just ask the receptionist to write the address for the cab driver, and grab a hotel business card so you can get back again. Xiangyang is a small city in Hubei of only half a million people, about 2.5 hours on the train from Wuhan. Foreigners are relatively rare here so you can expect to get stared at a fair amount but the flipside is that people will be quite friendly and well disposed towards you, unlike larger cities where you are less special. I had just two nights here so there is not that much I can tell you about the place. 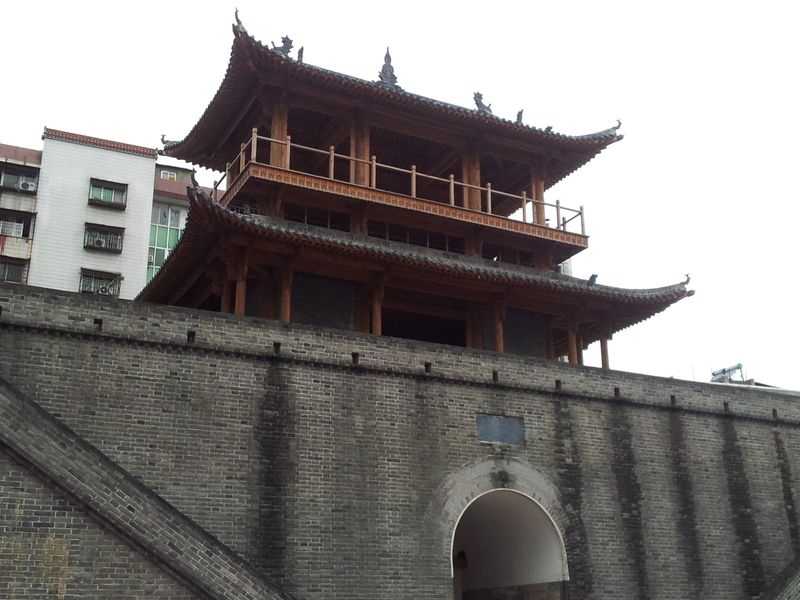 Xiangyang is also known for its old city walls although reviews on Trip Advisor say they are a modern reproduction. I didn’t have time to go see them but it may be possible to get to them on foot from the hotel in about 30 minutes. As you can see on this Google map, the fortress is just south of the Hanshui river, though I’m not sure whether either of the two bridges have pedestrian access. A taxi would be pennies probably. I was put up at the Celebrity Hotel (Te No.1 Paopu St, People Square, Tel. (710) 348 8888), a rather old and dingy hotel that I doubt has ever seen a sleb. The rooms are a fair size but the carpets are pretty grotty and the TV didn’t work in my room. On the other hand I could access my email for the first time since arriving in the country. The breakfast is probably fine if you’re Chinese but other than a couple of boxes of All Bran, some cheap white sliced bread with jam, melon and a greasy omelette there was nothing tailored for the Western palate. I went native for the duration and had the beef noodle soup each morning which was pretty tasty. Noodles are a bit risky for the work shirt though , it’s best to get your face right down to the bowl as the locals do to avoid splashes. There is a rudimentary gym with some flimsy looking machines and a pool full of noisy kids, both of which I avoided. The staff were unimpressive except for Felix the assistant manager who was very helpful and spoke a bit of English, unlike any of his colleagues. The check out receptionist struck me as being a racist though as she didn’t even look at me or say thanks. An experience you occasionally get sometimes as a Westerner in China unfortunately. I just ignored her back. So why stay here when you could be at the Crown Plaza uptown? In my case it was because my place of work for the two days I was here, the Happy Castle Disney Magic English Language Training Centre (! ), was just five minute’s walk around the corner. I couldn’t find any data about local restaurants on the net, or anywhere else, and the one time I did go out there was no picture menu to be had. Instead I just ate a big lunch and had the hotel’s complimentary fruit in the evenings. The school took me to a place down the side street over the road from the school (the restaurant is on the right in a small square/car park) where, rather than reading a menu, you pointed out what you wanted to eat from a series of cards hanging on the wall, although without help from the teacher I was with, I wouldn’t have known what most of it was. On the first day we had some steamed pak choi in garlic (B+), thin slices of stir fried silk tofu with chilli in a tasty sauce (A) and a mixed plate of lean and fatty pork with yet more chilli (A+). It was so good I couldn’t stop eating it but the hot spice combined with the humid weather meant I was dripping with perspiration by the time I left. The next day I went for the much blander stir-fried lettuce (!) with garlic (C+) and some cold roasted duck (C) which were much less appetising. For some entertainment in the evening I went to see what was happening in the People’s Square (turn left out of the hotel and go straight, over the crossroads, and you’ll see it on the left after a couple of minutes). Half of Xiangyang seems to be here letting their hair down in the cool evening air. 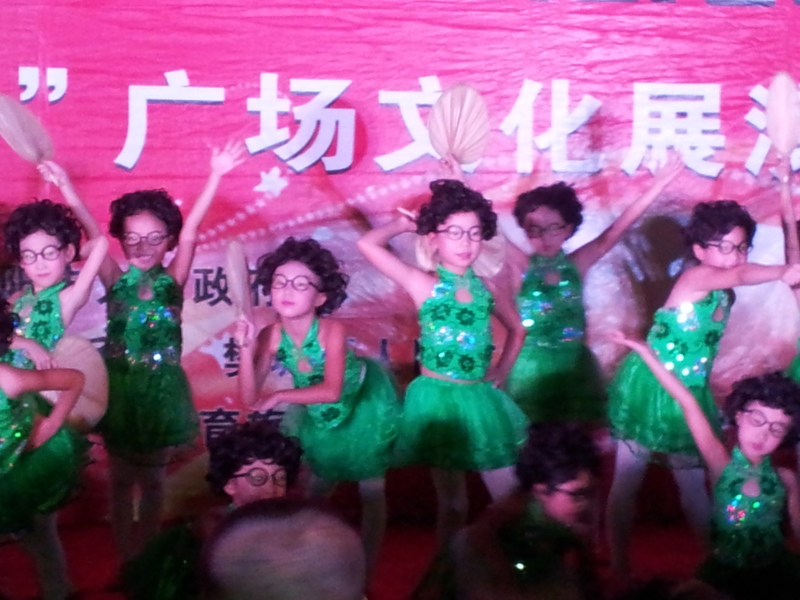 There’s a stage where the local kids can get a taste of stardom singing solos or dancing in troupes (love these kids in wigs and green outfits!) in front of an appreciative audience. There are several other competing sound systems where groups of middle aged women perform ballroom dancing moves together while the men stand around and watch. 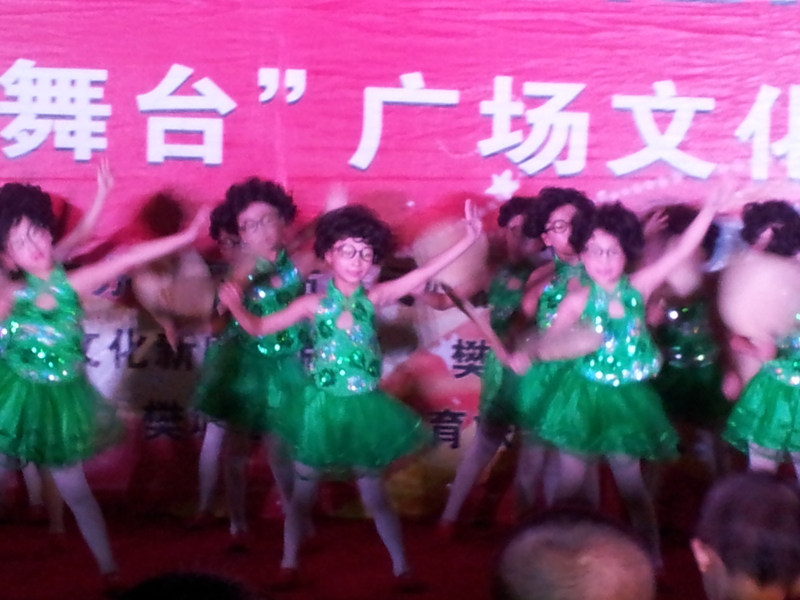 My favourites were the troupe of all ages doing the chachacha to Mercy by Duffy. The younger generation seem to prefer dancing to a frenetic form of electronic dance music (EDM) that’s all the rage in China, Korea and South East Asia generally. The dance style for this seems to basically be shuffling at high speed, as demonstrated by a couple of youngsters in the square. Behind the square there are the back streets lined with street kitchens offering piles of greasy looking bird carcasses, pig trotters and hearts and quite a few other things I couldn’t work out. I have given these kinds of places a try in the past (for noodle soups) but the lack of hygiene standards means that I can’t risk getting sick and jeopardising my job. Xiangyang is not a pretty place from what I saw but it was friendly enough and I enjoyed working there for a couple of days.